Here are two of our graduates Ben Steele and Hannah Blackman talking about the Cut Feather Group, part of the Sparkle Thief Cast. St Gregory’s Centre for Music proved to be the ideal venue for today’s lunchtime concert ‘Autumn Leaves’, performed a cappella by Canterbury Christ Church University vocal ensemble Top Voices, and directed by Chris Price. The magnificent stain glass window was also the perfect backdrop to this outstanding group of performers, whose harmonies and energy filled St Greg’s with such a beautiful sound. And an interesting and varied repertoire took the audience on a breathtaking musical journey from the 12th Century with O Virtus Sapientiae by Hildegard von Bingen (1098-1179) to the 20th Century with Puttin’On The Ritz by Irving Berlin (1926-1988), and culminating in a 21st Century arrangement of an African Celebration by Stephen Hatfield. I feel each of the 19 songs, all performed with such elegance and poise by each member of the ensemble deserves recognition, however for me there were a few favourites including the Introit O Virtus Sapientiae which opened the concert and created an engaging atmosphere for what was an hour of breathtaking singing. When I was in My Prime by Michael Glynn, was performed by three singers whose tone and tight harmonies made this performance of a traditional song simply enchanting. A rendition of My Grandfather’s Clock was also particularly charming, but an arrangement by Canterbury Christ Church University student Sara Wilson of Goodbye, My Coney Island Baby for four voices stole the show for me, it was charismatic, upbeat and thoroughly entertaining – exceptional! A Dance Education graduate: James Middleton is an ambassador for New Adventures Dance Company and the Re:Bourne Project. Dance students engaged in an intensive and creative week with two artists from Jasmin Vardimon Dance Company during the Easter holidays. Together artists and students created a wonderful piece of work called ‘The Werewolf’ based on a book by Angela Carter. Saturday brought us the final concert of the academic year, and what a concert it was! Each of the department’s directed ensembles delivered an extraordinary standard, showing the hard work and dedication over the year. First off, the String Orchestra, directed by Martin Outram, performed Copland’s Quiet City with Hannah Moseley and Matt Sherwood as cor anglais and trumpet soloists respectively. Next were the Symphony Orchestra, conducted by MMus student James Bolton King, with movements I, II and IV of Dvorak’s 9thSymphony. This is one of my favourite orchestral works and the Orchestra, and James, did a fantastic job of a really challenging piece. After the interval, the Augustine Octet, made up of Arisa Ota (BMus, Year 3), Tansy Agnew (BMus, Year 2), Clare Ventress (BMus, Year 3), Laura Howorth (BMus, Year 2), Will Sarjeant (BMus, Year 3), Neil Souter (BMus, Year 2), Emily Rossitter (BMus, Year 3) and Remco Schokker (BMus, Year 1), performed Mendelssohn’s Octet for Strings, Op. 20, Movement IV. As a student ensemble, with coaching from Martin Outram, the ensemble showed great control and overview of the piece, and play very well together. The soaring melodies sung out from each instrument and, despite a less than ideal acoustics in Augustine Hall, the octet made a really beautiful sound. Wind Orchestra, conducted by James Bolton King, followed with the quirky Cartoon by Paul Hart. The contemporary piece pays homage to the method of Mickey-Mousing in animation, where the music directly connotes the action of the characters on screen, so the audience were really able to image bizarre antics in a cartoon world. 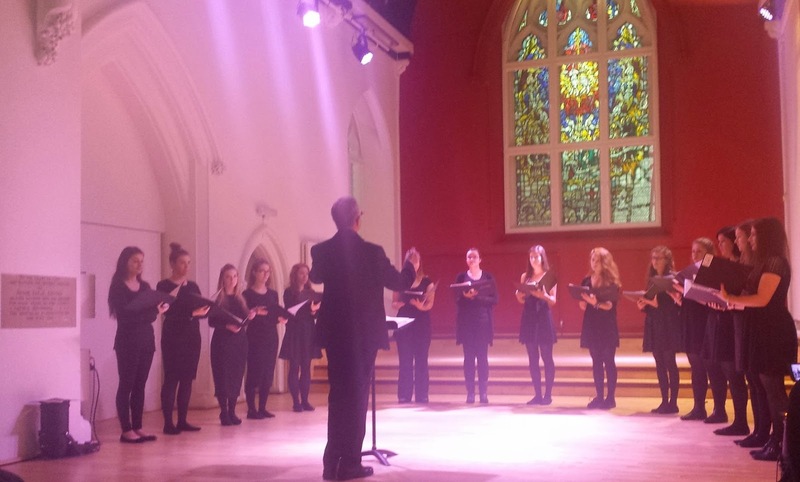 The final ensemble was Chamber Choir, formerly Cantata Choir, conducted by Dr David Allinson. The ensemble performed a number of pieces spanning from the 19th Century, with Pearsall’s haunting madrigal Lay a Garland to arrangements of popular classics Blue Moon and Gershwin’s Summertime, with a heartbreaking solo section sung by Philip Simpson (BMus, Year 3). The ensemble also performed Bruckner’s Os Justi, a personal favourite, and highlight of the night. The Contemporary Music Ensemble concert plus guests, which took place on Wednesday 11th June, was an exciting, eclectic mix of live music, a cappella singing, and electronically diffused compositions. This concert was the perfect end to an exciting season of contemporary music brought to us this academic year by the Contemporary Music Ensemble, under the direction of Dr. Lauren Redhead. The concert opened with an innovative piece called Hunting & Collecting, composed by MMus student Richard Kilner, and which included live electronics adding a fixed texture and some rather unusual nuances to the overall effect. Quad Piece followed, an electronic composition played in surround sound, which was met by an uncertain audience at first (perhaps due to the performer-composer being up in the loft space, rather than on stage). The composer Nat Feddon wrote the piece based on the original Star Wars trilogy and it presented a very cinematic explosion of sound. Towards the middle part I felt that an absent focal point in the stage area actually helped create an even more intense and concentrated ambience for the rest of the concert. Full Stop by second year BMus student Hannah Jacobi was simply outstanding, not least because it was performed so beautifully by Hannah and a group of other first year singers, but also because it was written with such sensitivity and understanding of the subject, the Holocaust. Hannah draws upon her own Jewish background, and uses extracts of well-known music such as Beethoven’s 9th and Hava Nagila to portray and express the feelings of repression and liberation experienced as a result of the Holocaust. An incredibly moving performance which set the pace for Trois Tiers, a piece for recorder trio which uses various musical intervals and tritons to produce a thin texture but with captivating harmonies. Quad Piece by Andrej Svaikov, was another electronic composition diffused through the surround sound, and looking to explore how the various rhythms and textures created through using a surround audio system are perceived. The finale was a twenty minute dramatic and incredibly intense interpretation of Louis Andriessen’s Workers Union (1975) by the Contemporary Music Ensemble, which showed great commitment from all the players and certainly illustrated the feeling of relentless drudgery, repetitiveness and isolation that Andriessen associates with modern society. A resounding success! Formed during LaunchFest 2013, Top Voices choir, led by Chris Price, gave their last concert of the year on Wednesday. Having been part of the choir since September, it was moving to see how it had progressed since the first performance – a success in itself given the week we had to prepare! On Wednesday, the ensemble, made up of undergraduate students singing soprano and alto, performed a huge variety of pieces, from 12th Century plainsong (Hildegard von Bingen’s O Virtus Sapiente) to famous pop classics (Puttin’ on the Ritz – Irving Berlin andAfter the Goldrush – Neil Young), and everything in between. The programme was a reflection of the ensemble’s versatility, not only with regards to genre and style, but also to vocal range as, often, the girls would switch parts to rebalance to choir, or just to try something new. A highlight for me was being able to sing the principal line in When I was in my Prime, as I had done in LaunchFest 2013, it was a nice round up of the year spent with the choir. The piece is different to a lot of the other repertoire and its folk style really appeals to me. While many of the arrangements we sang were by Chris Price, we also sang a piece composed by him, Thus I Infuse. It was one of the ensemble’s favourites due to its driving middle section (complete with a catchy ‘Batman-like’ motif!) and clashing harmony throughout. As well as shorter pieces, the choir sang Stephen Hatfield’s African Celebration: a melding of different motifs and chants to celebrate African culture, with the African anthem serving as a calming interlude. The piece served up many challenges during rehearsals and it was a massive achievement to have sung it successfully and convincingly. The concert was a huge success, and enjoyed by the staff, students and public that attended, and I can’t wait to see what Top Voices can do next year! Canterbury Dance Company and The Fantasy Quartet delivered a fantastic lunchtime concert on Wednesday titled Insieme (Together). The quartet, made up of Hannah Moseley (oboe), Arisa Ota (violin), Will Sarjeant (viola) and Emily Rossitter (cello) flawlessly played E. J. Moeran’s Fantasy-Quartet (1946) while the dancers (Daniel Anthony, Michaela Cisarikova, Maddie Delderfield, Sarah Dobney, Aaron Smith and Francesca Thurston) responded sensitively to each other, the sound of the quartet and the space of St. Gregory’s to an engaged audience of students, staff and members of the public. It’s always a pleasure to hear the quartet play: their sense of ensemble and feel for the piece is a joy to experience!